In the neighborhood of Watson’s land. Plat book 1, map 254. This 1937 notice of sale of the property of John A. and Nannie K. Watson contains bits of information about land ownership by African-Americans in Taylors township, a few miles northeast of the town of Wilson. Detail of lots 1 and 2 of the Ellis & Woodard tracts. 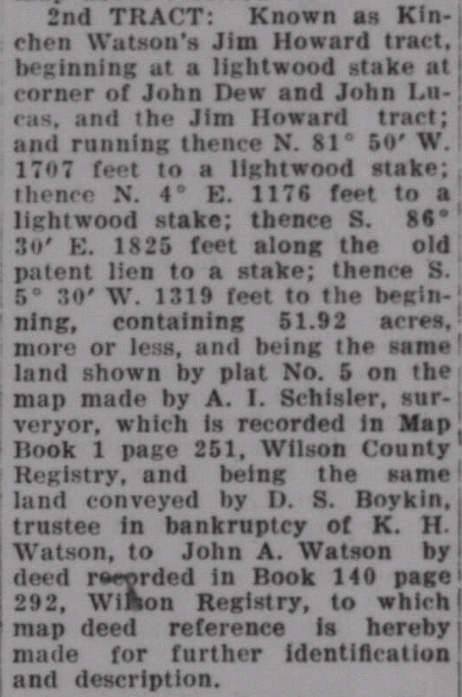 The second tract up for auction, “the Jim Howard tract,” is marked Lot 5 on the plat map at page 251 of Plat Book 1, below. The third tract, the “Lamm tract,” consisted of Lots 1-4 of the plat map below. 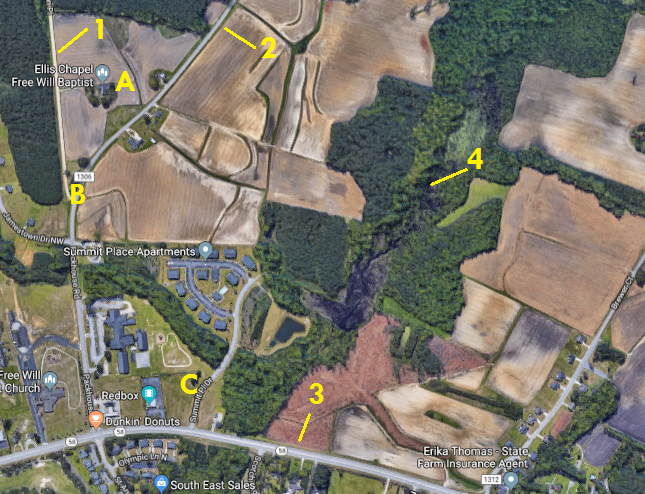 These properties were surrounded by tracts belonging to African-American men whose families were connected by blood, intermarriage and historical status as free people of color. James G. “Jim,” Kenyon, Jesse and Allison (not Anderson) Howard were sons of Zealous and Rhoda Eatmon Howard, and William Howard appears to have been a grandson. Charles Brantley‘s daughter Mollie married her cousin Kenyon Howard. John and Kenyon “Kenny” Locust (also spelled Locus and Lucas) were father and son, and John’s mother was Eliza Brantley Locus. Wilson Daily Times, 29 November 1937. Plat Book 1, Page 251. Per Google Maps, the area shown in the first plat today. 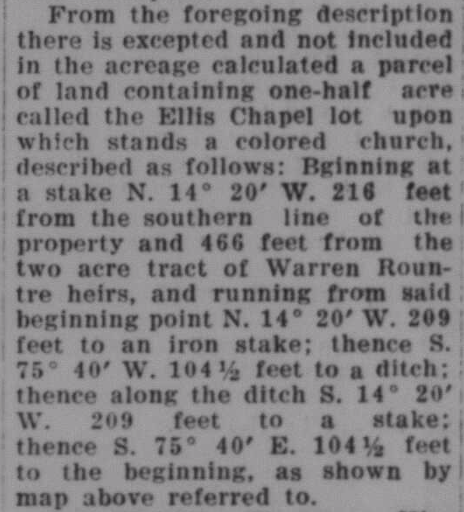 At (A), Ellis Chapel Free Will Baptist Church; at (B), the approximate location of the Warren Rountree heirs’ two acres; at (C), the Hilliard Ellis cemetery, which is outside the Watson land; at (1) Aviation Place; at (2) Packhouse Road; at (3) N.C. Highway 58; and at (4) Little Swamp, which is a tributary of Toisnot Swamp. Plat books at Register of Deeds Office, Wilson County Courthouse. 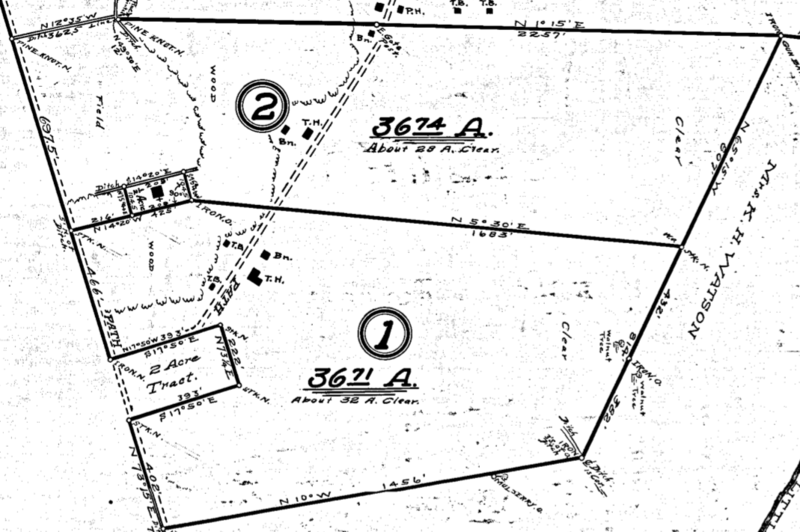 This undated plat map shows lots 2 and 3 of the subdivision of the “Singletary Land,” laid out in 14 blocks divided into 176 roughly 50′ wide lots. The streetscape is easily recognizable to the modern viewer. There have been some moderate changes in the layout — Freeman Street no longer intersects Nash (which is a street now, not a road) and nor does Wainwright. The original course of Wainwright, which is a street now, not an avenue, essentially lies under present-day Hines Street. Bardin Street is Rountree Street, and Mewbern morphed into New Bern Street. Plat book 1, pages 482-483, Register of Deeds Office, Wilson County Courthouse; aerial image courtesy of Google Maps. After years of complaints about deteriorating conditions at the Sallie Barbour School, Wilson’s Board of Education finally constructed a new elementary school for African-American children in southeast Wilson. The opening of Elvie Street School left Sallie Barbour School obsolete, and the city made plans to sell off the property. The first plat shows a survey of the property as it existed in January 1951 — the frame school building (which dated from the 1890s) with its distinctive five-sided porch , a small frame lunch room off to one side, and a brick toilet building in the rear. The second plat shows, superimposed over an outline of the buildings, the proposed division of the land — known to this day as “The Schoolyard” — into 28 lots. The Schoolyard today. About 1955, a developer built a row of double-shotgun houses on the Manchester Street side of the property. The Black Creek Road (formerly Stantonsburg Street) side is now home to a small supermarket and a series of apartment buildings. Plat Book 5, pages 32 and 34, Register of Deeds Office, Wilson County courthouse; photo courtesy of Google Maps. Plat Book 2, page 152, Register of Deeds Office, Wilson County Courthouse. This 1943 plat map shows several lots laid out in the 1400 and 1500 blocks of Washington-Carver Heights, as the neighborhood created by East Wilson’s eastern expansion was called. The blocks east of the highway were not annexed into the city’s limits until the 1970s, despite years of demand. Doris Street, originally named for one of Samuel H. Vick‘s daughters, is now Powell Street. Tuskegee Street, like Washington and Atlantic (originally, Atlanta) Streets, was named in honor of Booker T. Washington. “N.C. State Highway” is now U.S. 301, a four-lane highway with median. Plat Book 2, Page 176, Register of Deeds Office, Wilson County Courthouse. Property of the Julius Freeman heirs. Lydia Norwood — Lydia Ann Freeman Norwood Ricks was a daughter of Julius and Eliza Daniels Freeman. Robert Norwood, 24, married Lydia Freeman, 21, at the residence of Julius Freeman at 26 January 1899. Episcopal priest W.B. Perry performed the ceremony in the presence of William Kittrell, William Barnes and John Williams. In the 1920 Hill’s Wilson, N.C., city directory, she is listed as a domestic living at E Nash extd, R.F.D. 4. In the 1940 census of Wilson, Wilson County: at 1025 Roberson Street, owned and valued at $1000, tobacco factory laborer Egar Ricks, 49; wife Lydia, 62; and daughter Eliza Norwood, 39, tobacco factory laborer, tobacco factory laborer. Renting rooms in the house for $8/month were widow Dora Bynum, 40, tobacco factory laborer; her children Charles, 9, Dorthy, 6, and Joseph Bynum, 2, and Rosa Lee, 15, and James Joyner, 12; and widow Rosetta Farmer, 59. Lydia Ricks died 14 October 1960 at her home at 1025 Roberson Street. Per her death certificate, she was 84 years old; was born in Wilson County to Julius Freeman and Eliza Adams; and was married to Eddie Ricks. Dr. B.O. Barnes — Boisey O. Barnes Sr. The elbow of East Street and Darden Lane. The division of Kenyon Locus’ land. Plat Book 2, Page 171, Register of Deeds Office, Wilson County Courthouse. Kenyon Locus‘ estate included about 66 acres of land in Taylors township, Wilson County. His property was divided and platted in January 1942, a little over a year after his death. It was bordered on the north side by a road leading to the Wilson-Nashville Highway [N.C. Highway 58] and on the west by a road leading south to Wilson via Ellis Chapel. The property to his south was jointly owned by Charlie Brantley and Mollie Howard, heirs of Henderson Brantley. To the north was acreage owned by Will and Sylvia Howard (or Batchelor) Lucas. A house and several other buildings cluster on a small road that hooked across the northwest corner of the property. In the 1880 census of Jackson township, Nash County: John Locus, 30; wife Delpha, 30; and children Frank, 10, Dora, 8, Kenny, 5, Nancy, 4, and Samuel, 9 months. In the 1900 census of Taylor township, Wilson County: Johnnie Lucus, 43; wife Delpha, 51; children Kinion, 26, Nannie, 24, Edwin, 15, Sidney, 12, and Susan, 9; and grandsons Bunion, 5, and Martin L., 3. In the 1910 census of Taylor township, Wilson County: on Howards Path, John Locust, 66; wife Delphia, 64; children Kinyan, 36, and Susie, 19; and grandchildren Bunyan, 15, Luther M., 13, and Roxie, 7 months. In the 1920 census of Taylor township, Wilson County: John Locus, 77; wife Delphi, 65; son Kennie, 48; and grandchildren Roxie, 11, and Luther, 23. In the 1940 census of Taylor township, Wilson County: Kerney Locus, 67; wife Bell, 53; and lodger Frosty Pond, 33. Kenney Locas died 10 December 1940 as the result of a terrible farming accident. Working in a field on his farm, he slipped off a stalk cutter and suffered a crushed leg and pelvis. He was taken to Mercy Hospital, where he was declared dead. Per Locus’ death certificate, he was 66 years old; was married to Isabella Locas, age 55; was born in Wilson County to John Locas of Wilson County and Delphia Taylor of Nash County; and worked as a farmer. 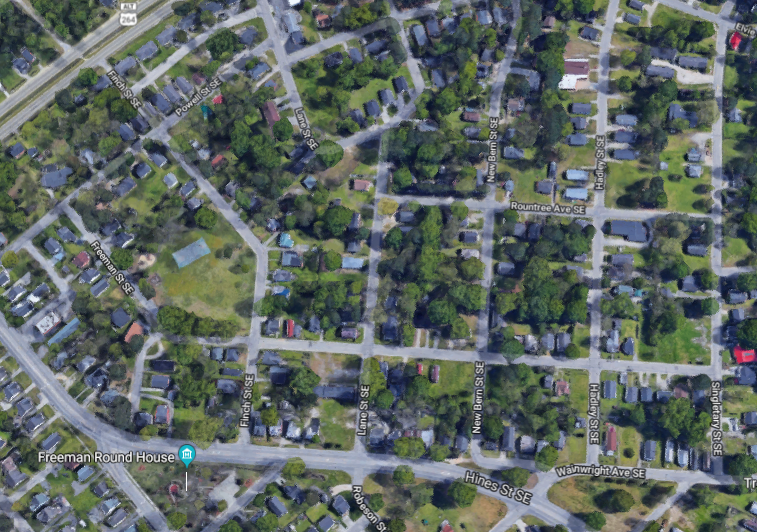 In the spring of 1947, Economy Homes, Inc., a Winston-Salem developer, filed a plat map for a subdivision to be laid out two miles southeast of town along Black Creek Road. 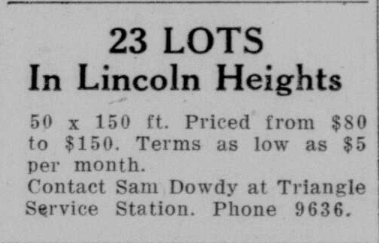 Lincoln Heights consisted of 116 lots of various sizes to be offered to African-American buyers. Plat Book 4, Page 71, Register of Deeds Office, Wilson County Courthouse. Post-war housing in Wilson was scarce, and lots in the new development sold immediately. 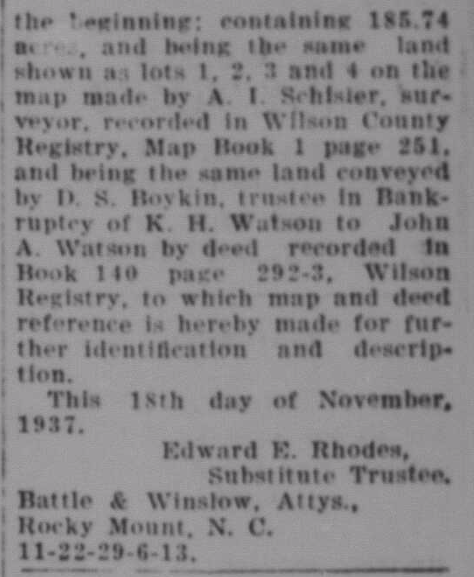 Just ten days after the plat map was recorded, the Wilson Daily Times listed lot sales to Samuel T. Dowdy and wife, Julia Farmer Johnson, James T. Horton, Ernest McKinnon, I.V. Dringle, Oscar Eatman and Israel Thomas. 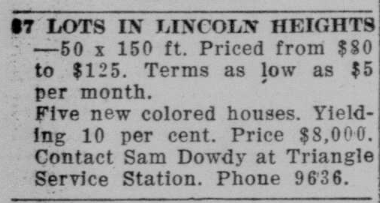 Dowdy, who was white, was a speculator and later ran ads selling houses and lots on terms. Wilson Daily Times, 31 July 1947. 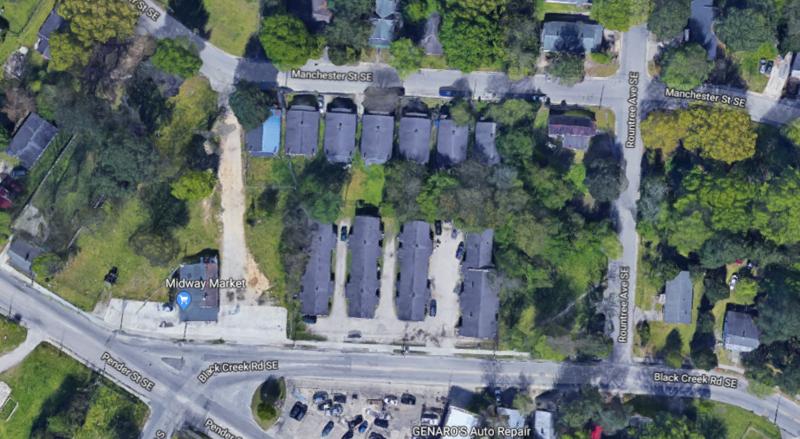 The smaller lots filled with single-family homes, but the long, narrow lots at the right side of the plat eventually — apparently, in the early 1970s — became the site of Lincoln Trailer Park. Today, nearly all of it is scrub pine and weedy fields. Lincoln Heights had no height at all, and eventually the repeated ravages of its low lands by the overflowing Hominy Swamp canal won the day. 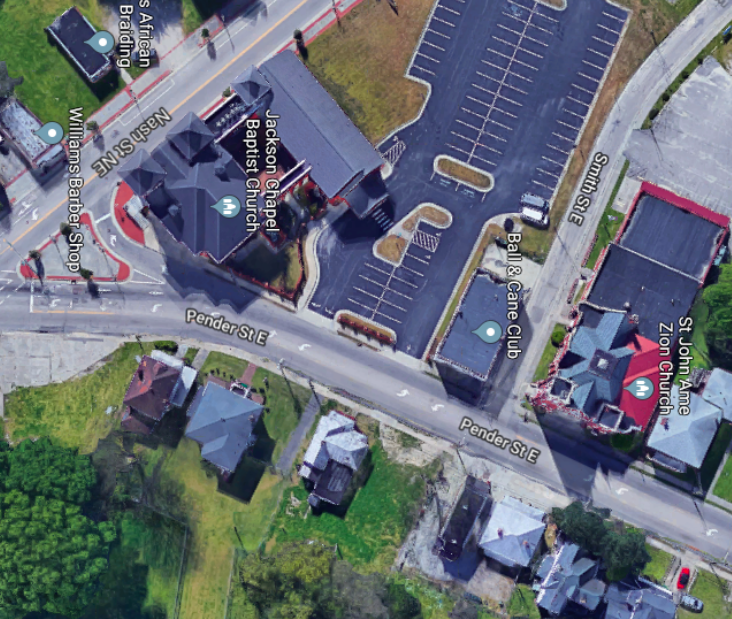 Here is an aerial view of Lincoln Heights, courtesy of Google Maps. The “Williams Street” of the plat became Wills, and “Charles” became Charleston. 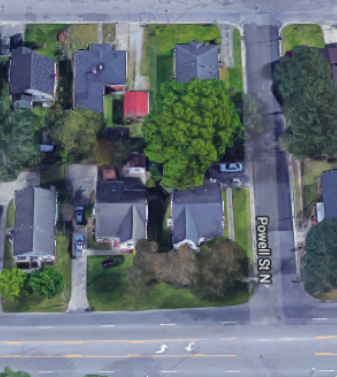 Elizabeth Street was never cut through, but Purdie curved around to intersect Old Black Creek Road, cradling several smaller streets that were once lined with house trailers. By the mid-1970s, the Daily Times was regularly running stories of boat rescues and electricity shut-offs in Lincoln Trailer Park during hard rains and complaints about the clogged and under-dredged canal in the aftermath. Catastrophic flooding caused by Hurricane Floyd in 1999 devastated Lincoln Heights. As the century turned, the city of Wilson, using federal funding, began to condemn houses and buy out landowners. Though Lincoln Heights is marked on a 2018 digital building map, only a handful of houses along upper Wills Street remain occupied. An abandoned house at the dead-end of Wills Street. Purdie Street is now fenced off at Old Black Creek Road. Hominy Swamp Canal seems innocuous — at least in terms of volume flow. Otherwise, it is filthy. In 2002, the city erected signs showing the Hurricane Floyd high-water mark. The sign is perhaps 100 yards from the course of Hominy Swamp and shows a flood depth of about four feet. Samuel H. Vick‘s house still towers over East Wilson, but that of contemporary giant Charles H. Darden is long gone. At first glance, I thought this plat map showed the location of the Darden house on Pender Street near Nash. Upon further study — not quite. The Dardens lived at 111 (formerly 110) North Pender Street, and this two-story house was at 113 (formerly 116) North Pender. The Dardens did own it, however, and rented it as a multi-family dwelling. 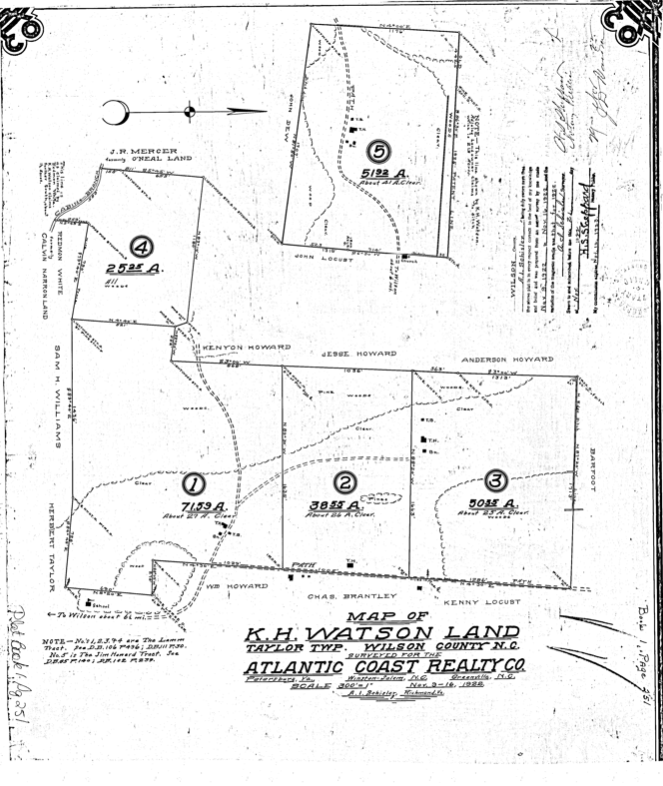 A surveyor drew the plat map in August 1946 and titled it “Property of C.H. Darden-Hebron Masonic Lodge #42.” Though the only building drawn in is the house at 113, the block was densely built, and nearby property owners are noted, including Saint John A.M.E. Zion Church, Jackson Chapel First Missionary Baptist Church, Columbus E. Artis, D’arcey C. Yancy, and Charles Darden’s son Camillus L. Darden. 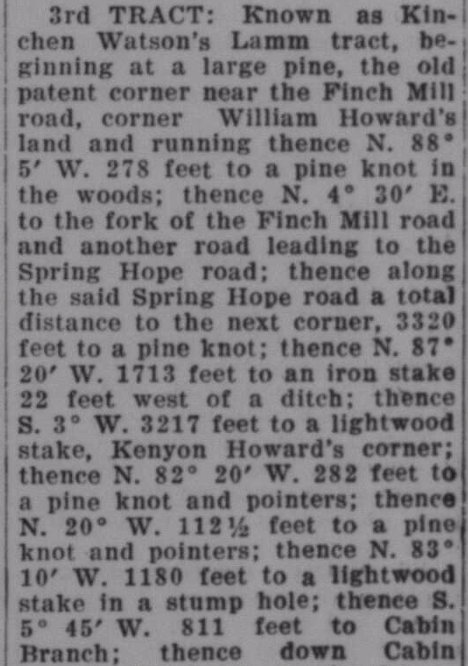 The survey apparently was intended to resolve a dispute over the location of the lot line between Darden’s property (or that of his estate, as he died in 1931) and Mount Hebron Lodge #42, which was preparing to erect a replacement hall at 115-117 North Pender. 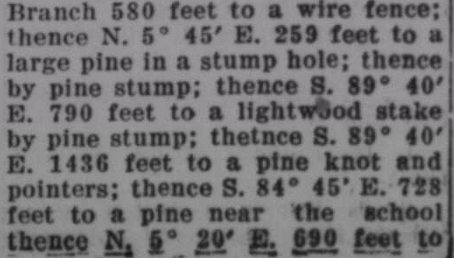 As noted on the map, the boundary descriptions in the deeds for each property were vague. The Masons believed their southern lot line ran right through the middle of the house at 113, while the Dardens placed it a few north of the house’s edge. 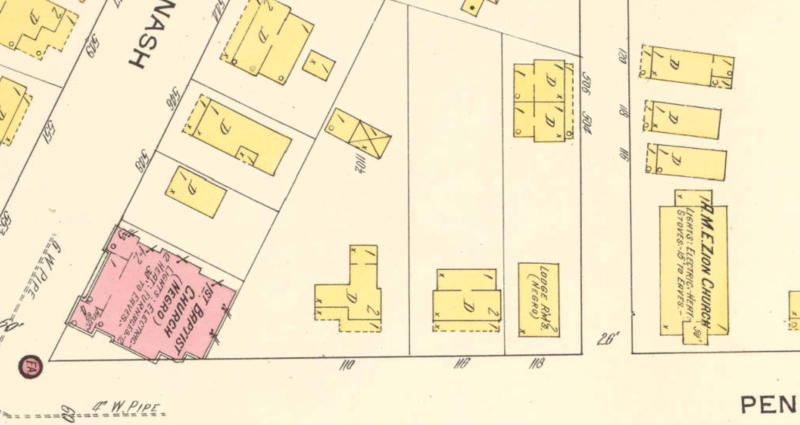 The 1908 Sanborn fire insurance map of Wilson, below, shows the old wooden lodge building and the house beside it. (The lot line is notably consistent with the 1946 map plat.) 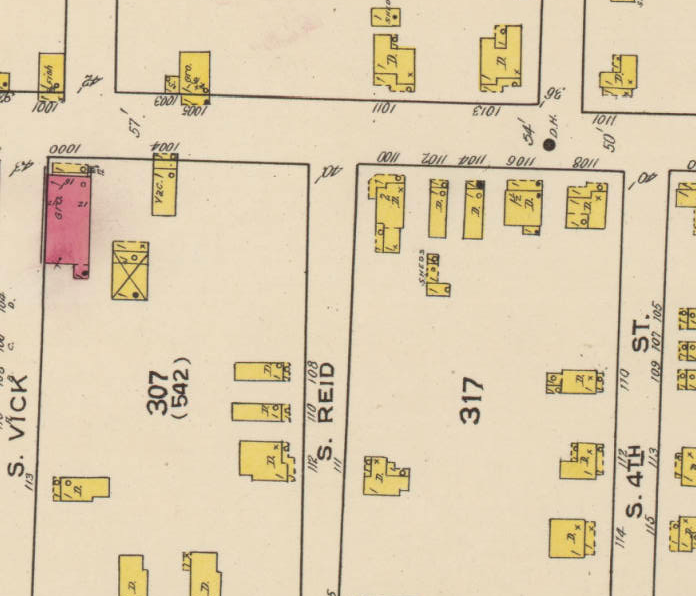 The corner of Vick and Pender was an empty lot, and Smith Street was “Zion Alley.” Charles H. Darden’s house is on the wedge-shaped lot at 110 East Pender. 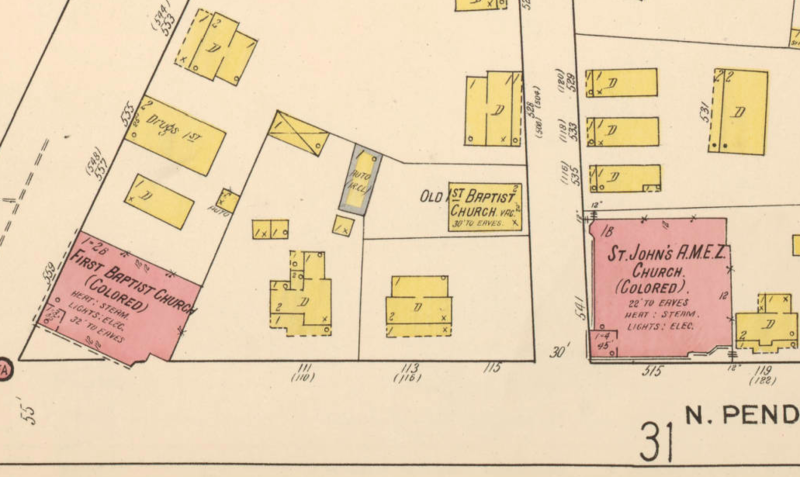 On the 1913 Sanborn fire insurance map of Wilson below, note the newly built First Baptist Church, whose pink shading indicates that it was constricted of brick. Saint John A.M.E. Zion, on the other hand, was a couple of years away from its grandest edifice. The 1922 Sanborn map, see below, depicts the new Saint John building. The lodge hall is, curiously, absent, and an “old 1st Baptist church” that I have not been able to identify is shown facing Smith Street. (How old could it have been if it were not built until after 1913?) The Dardens had added several small outbuildings, including a garage, to their parcel. 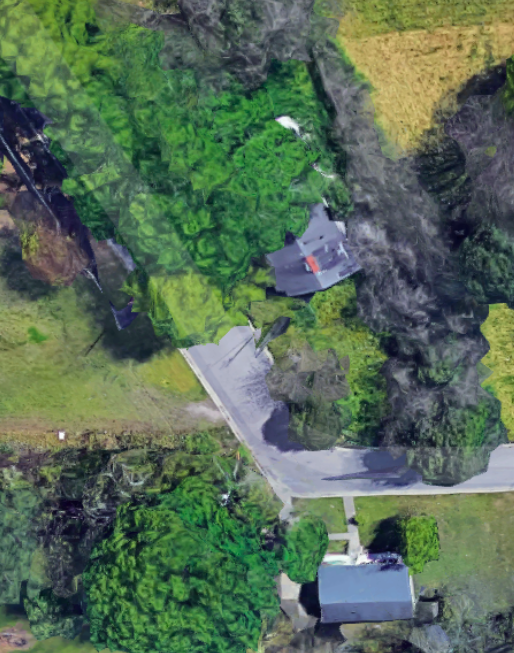 The house at 113 occupies half of a single lot, which is almost certainly a mapping error. The site today, as shown in an aerial Google Maps view. The building marked “Ball & Cane Club” is the Masonic lodge hall built in 1947. (The club, now defunct, housed their social functions.) The sites of the houses at 111 and 113 North Pender are now under the parking lot of the expanded Baptist church. In the 1930 census of Wilson, Wilson County: at 111 Pender Street, valued at $6000, undertaker-proprietor Charles H. Darden, 76; wife Mary E., 67; and granddaughter Cora Brown, 22, drugstore clerk. At 113 Pender, five families: (1) paying $14/month rent, fertilizer plant laborer James Edwards, 29, wife Frances, 32, and Rufus G., 14, Julious G., 12, and Willie G., 13; (2) paying $8 rent, hospital janitor Andrew Reid, 27, and wife Sarah L., 30; (3) paying $8, Carl Henborn, 39, building carpenter; (4) paying $4, Neil Ray, 31, junk shop laborer, and wife Annie, 23; and (5) paying $4, cook William M. Powell, 38. In the 1940 census of Wilson, Wilson County: at 113 Pender Street, (1) paying $12/month, Ethel Cain, 32, elementary school teacher, and mother Delia Jones, 66, cook; (2) paying $4, Charles Nelson, 36, pressing club presser, and wife Mamie, 34; and (3) paying $4, Hubert McFail, 35, tobacco factory truck driver, and wife Viola, 20, school teacher. Plat Book 4, page 46, Register of Deeds Office, Wilson County Courthouse.